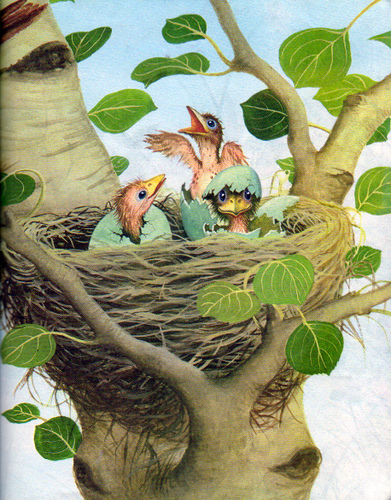 For the next week I will be posting gorgeous old images from vintage children's books and accompanying them with a 'Dad story'. Most people are familiar with the Dad story, however if you're not here's the 411. It's a story that gets told two to four times per year. Usually on occasions where said Dad has captive audience. Dad stories are generally mildly funny and always told with the enthusiasm as the legendary 'first telling'. Often names, dates and places take a little poetic licence and Janet will become Janice etc. etc. Join in if you like and tell your 'Dad story' ... leave a link below with Mr Linky. Also you have until Thursday to get comment here to win a REread brooch! Batty was our orphaned flying fox. He was a cute little guy who smelt like fermenting paw paw and liked to hang from the rear view mirror when Mum drove us to school. My best friend and I loved this unoriginally named little guy, we took him for walks on the beach, to the family dinner at the pub and we tried our hardest to teach him to fly. We wanted Batty to learn to fly so he could join his noisy bat friends and so we could get another little orphan to play with once he'd 'returned to nature'. So we took to hanging him from the monkey bar we had hanging from the rafters in the house. We stood there night after night swinging him higher and higher. His thin, veined black wings would open up and he'd flap, flap and ... nothing. Maybe this bat was not going to fly, maybe he'd just be a fluffy dice substitute forever. On the night he finally did learn to fly we were all sitting on the veranda watching his flapping routine and then suddenly he did it. Batty launched himself off the monkey bar swing and with a wonderful sounding 'whoop' he took off. On about his third 'whoop' a rather large, white owl descended from out of nowhere grabbed our dear friend in his talons and promptly flew off into the dusk. We stood there agape as the awful screaming trailed off into the distance and my Dad said very matter of factly "well, ... that's nature kids." Batty was our last orphan flying fox. Mum just got us some guinea pigs after that. I just love vintage childrens books!